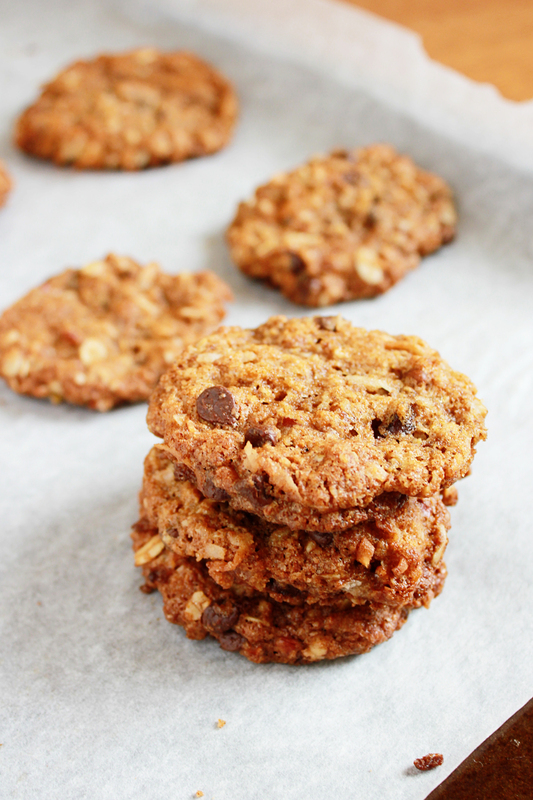 Thick, delicious Cowboy Cookies are loaded with coconut, chocolate, oats and pecans. Last saturday we attended a 1st birthday party for the son of one of my best friends, it was an adorable western themed celebration. She literally went all out – cow balloons and cake, bandanas, Sheriff stars, stick on mustaches and even themed food; it was a blast! The party favors were absolutely adorable too, Mason jars of cowboy cookie mix. Today’s recipe is an adaptation of the award winning “Cowboy Cookies” by Laura Bush. A thick, delicious cookie loaded with a blend of coconut, chocolate, oats and pecans. I wanted to lighten the recipe up just a bit, without sacrificing any flavor and so coconut oil seemed just the perfect fit. These cookies not only smell amazing… they taste it too, enjoy and happy baking! In a large bowl combine the flour, sugar, salt, baking powder, baking soda, salt and cinnamon. Stir in the chocolate chips, coconut, pecans, egg yolk, coconut oil, almond milk and vanilla, until the cookie dough starts to come together. Divide the dough into 12 balls and place 2 inches apart on baking sheet, bake for 11-12 minutes. Remove from the oven and cool 5 minutes, serve warm. I love that you lightened these up with the coconut oil. It is my new go to for recipes!!! Ahh these look yummy and crumbly! Have to say that kids’ birthday party sounded awesome, I’m very jealous! Just dropping by from Saturday Sharefest. Enjoy the rest of your weekend! OMG these look great. I do bake vegan though because my husband can’t have eggs or dairy. How could I substitute the egg yolk? Right now I can’t think of anything. Yum! Delicious. Sounds like my type of party I’d design. I am drooling looking at those cookies and reading the recipe! I definitely will have to try them. I just stopped by from SITS to say hello; hope you find time to return the visit.